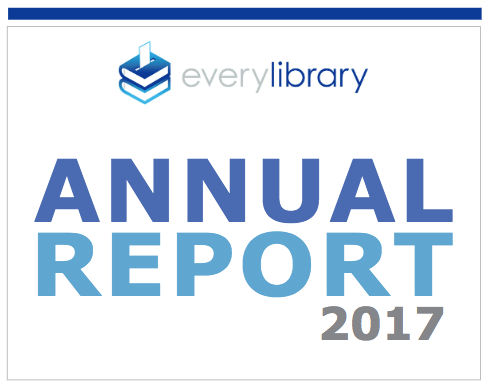 Making a monthly donation to EveryLibrary is the easiest way to make a difference in American Libraries. This donation page uses Paypal but You can also make a contribution via ActBlue here. Here at EveryLibrary, we take the fight for libraries very seriously. Thanks to our donors and supporters we have been able to work with dozens of library campaigns, we have fought against bad legislation against libraries in Nebraska, Michigan, and Kentucky, we have taken action as the AFP spent tens of thousands to keep a library from being built, and we have taken a stance against school library closures across the country. With support from people like you we have won many of these fights. In fact, for every dollar that we have raised we have returned over $1,600 in funding to libraries totaling over 260 million dollars so far. That means that a monthly contribution of just $5 a month can help ensure almost $100,000 in stable library funding. Little do those fighting against libraries realize that libraries are one of the best investments a community can make. They often return between $5 and $10 to the community for every dollar spent on them to the more than 150 million Americans who visit them every year. From storytimes, to after school help, to resources and services to small business and startups, libraries make a huge impact in the lives and livelihoods of Americans. By allowing us to collect data and conduct research about activating voters and the public to support libraries. We can’t do this work without the support of people like you. Your monthly contributions are integral part of fighting for libraries. Your ongoing donations help us to take political action on behalf public, school, and academic libraries. All of our work with libraries is pro-bono to the library and made entirely possible by your contributions. Your contributions are what allows our research team to collect data and conduct much needed political research to help us find new ways to reach the public and activate them to support libraries. To date, we have helped libraries win over 250 million dollars in funding through voter and political action and every year we put over 10 million ads about the importance of libraries in front of voters and the American public to encourage them to support and take action for their local libraries. If we reach our funding goal we will be able to help libraries win hundreds of millions more in library funding and put tens of millions of ads about libraries in front of even more Americans. Librarians all over the country are counting on you to support this important work! As a 501(c)4 organization, contributions to EveryLibrary are not tax deductible. EveryLibrary is a registered 501c4 organization (FEIN 46-1534149). We invite you to check up on us before donating by finding out more about us on Guidestar, the most trusted guide to non-profits on the Internet. Who's donating: Jenifer May from Secaucus, NJ donated. Thank you!